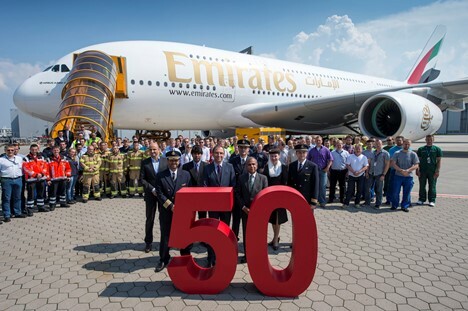 Emirates received its 50th Airbus A380, strengthening its position as world leader in the use of this aircraft for long-haul flights. With this latest release, the widebody fleet Emirates totaled 224 aircraft, including most of the world fleet of A380s and Boeing 777 fleet largest worldwide. Since April 2010, Emirates received 96 aircraft (all A380s or B777s), while it has consistently maintained a load factor of about 80%. During this period, Emirates has also added 48 cities to its global network of destinations. Sir Tim Clark, President Emirates Airline said: "Emirates has experienced tremendous organic growth over the past four years, probably the fastest ever experienced by an airline. Our increased capacity amounts literally to which airlines operate some medium; but most significantly, we have maintained a high occupancy factors and profitability. " Emirates has the largest A380 route network operated by a commercial airline, serving 27 airports right now on 5 continents. Your Dubai route - Los Angeles is the longest flight of A380 operating worldwide. Later this year, the number of destinations served by Emirates A380 will amount to 33 with the addition of Kuwait from 16 July to Mumbai from 21 July to Frankfurt from September 1, Dallas from 1 October to San Francisco from December 1st and Houston from December 3. To date, the fleet of A380s the airline has carried 27.5 million passengers, made 68,800 flights and has traveled over 405 million miles. The Emirates A380 has also visited over 40 airports worldwide in test flights and extraordinary services. Currently, Emirates has more than 10,000 cabin crew and more than 900 pilots specifically trained to work aboard his growing fleet of A380s. Emirates has commissioned 299 widebody aircraft, including 90 A380 other, helping to create and sustain thousands of jobs in the manufacturing supply chain. Many of the new aircraft have replaced older models of the current fleet of Emirates. The average age of the Emirates fleet is 74 months compared with 140 months industry average. The delivery flight today, the Airbus Foundation and Action Against Hunger organization sent 41 tons of cargo in support of energy bars several nutritional programs implemented in the region, mainly in Yemen. The peanut bars made will go to children under five suffering from acute malnutrition. The charge is stored on the premises of United Nations Humanitarian Assistance in Dubai and will be the largest air cargo shipment of humanitarian aid in the history of Airbus. Thanks for creating this story - I read it with great interest. It is amazing that they have taken so many and equally amazing that Airbus can build such complex aircraft so quickly.